"This recipe came from my step-mom in Dallas, Texas. They like it hot so they put in a few extra jalapenos." In a saucepan over medium-low heat, melt the cream cheese and butter, and mix with the milk until smooth and bubbly. 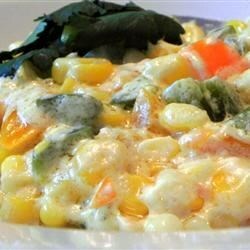 In a medium casserole dish, mix the frozen corn, red bell pepper, and jalapeno peppers. Pour in the cream cheese mixture, and toss to coat. Bake 35 to 45 minutes in the preheated oven, until bubbly and lightly brown. I love this recipe. Serve with mexican rice and chicken enchiladas and get rave reviews!! Goooood spicy! This is so darn good! What a great side dish.I added even more jal. Thank you for posting.